I’ve been writing for a long time, and one of the things that I learned early on, is that there’s a lot to like about most everything you get to review. Your TRUE opinion usually hits after the honey moon period is over. THAT can last a couple of months, depending on the device/gadget/thingy you’re reviewing. Getting past the WOW factor is important, and most product reviewers just can’t do it in a couple of days to a week. When I saw the Soda Stream Penguin Starter Kit, the wow factor for me was pretty high – a nine or a ten (on a 10 point scale), and I knew that any kind of review would take a while. The device is, after all, pretty cool (more below); but let’s can the chit-chat and get down to brass tacks. 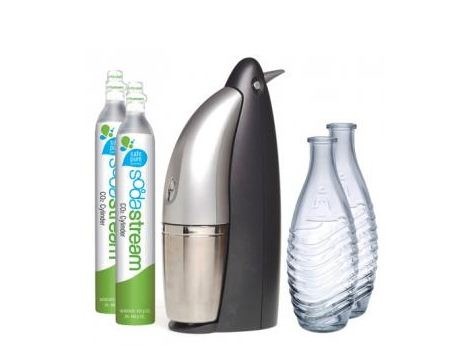 The Soda Stream Penguin Starter Kid – Yeah or Nay..? Read on for a combo video/picture and text review. How to Make Your Own Soda – So Easy, Even a 4 year Old can do it! I also noticed that much of the components in the machine are made of plastic. 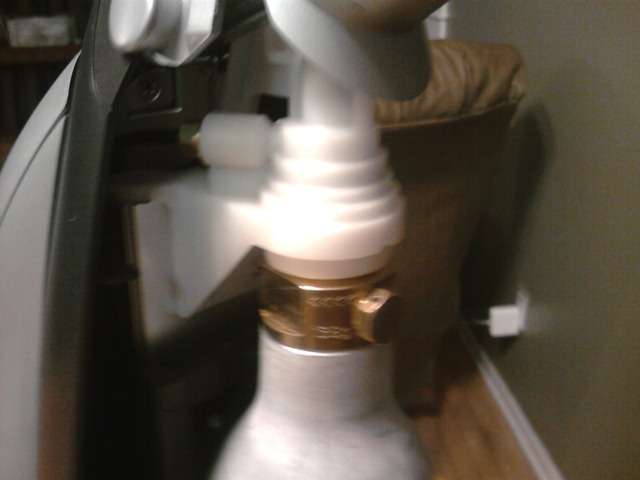 During my review, the main part of the soda maker that controls the valve on the carbonator simply snapped. I was shocked! It just…snapped! I tried a couple different types of Crazy Glue to fix it, and neither worked. The plastic wouldn’t bond with the glue. I even tried Gorilla Glue (it works with EVERYTHING, especially skin) and even it wouldn’t make the pieces stick together (it even expands to fill gaps as it cures). The type of plastic is unusual in the Penguin, so you need to make sure that it doesn’t drop, get bumped, etc., as if it breaks, you’re done. In my case, it seems I encountered a very RARE manufacturing glitch. The replacement soda maker that I was shipped has really done well and hasn’t missed a beat, even when Sam and Josh help me make a batch of soda. This is the component that broke on me. I’m not sure how or why; but I was told that it happens, but it is very rare. The carbonator (bottle of gas) screws into the machine here; but it needs to be TIGHT! The plastic used here is very good at making a seal with the carbonator, but you need to make sure that the seal is tight. The pressures that we’re dealing with here are incredible, and you need to be careful. This is the piece that inserts into the water in the carafe. The infuser inserts itself into the top of the carafe when the top closes and the gas shoots into the water through it. 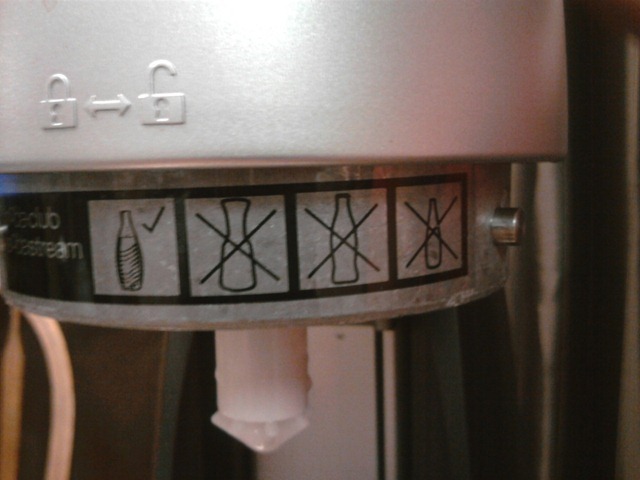 Only use an approved carafe in the machine. 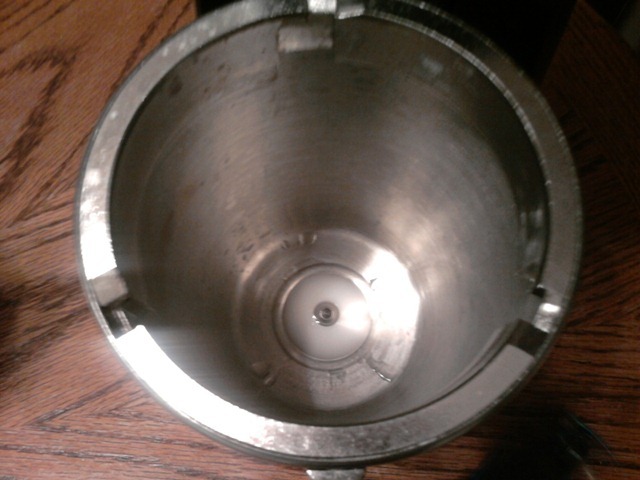 The inside of the carafe. Price: The Soda Stream Penguin Starter Kit comes with the Penguin Soda Maker, 2 Carbonators, and 2 glass carafes, and retails for $249.99. At the time of this writing, however, it is on sale for $199.95 directly from Soda Stream USA. It can also be purchased at a number of different local retailers by using their store locator. Stocked products and prices will vary. What I liked: Being able to create as much or as little carbonated beverage as I liked or needed. Making the soda is fun, and is easy for everyone to do. You control the degree of carbonation, so drinks are as flat or fizzy as you like. What Needs Improvement: You have to like Splenda as a sweetener, or you’re not going to like the Soda Stream beverages. Most of them have a “diet” taste to them. Some more so than others. While this isn’t necessarily a bad thing, it is something you need to be aware of. Splenda has a very distinct taste, and you have to like it if you’re going to like these beverages. You can ONLY carbonate water. Any attempt to carbonate anything else other than water usually results in an overflow of some kind, regardless of how carbonated you make the beverage. 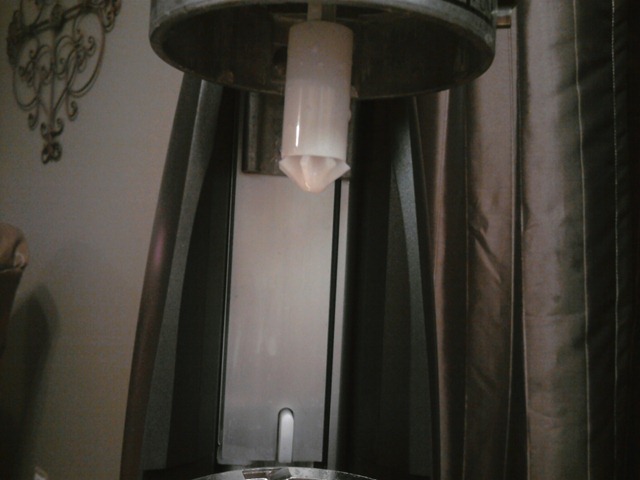 Plastic parts can sometimes break, as my soda maker experienced a “blow-out” while making a bottle one Sunday evening. Not even Gorilla Glue would fix it (due to the type of plastic used), and it glues nearly EVERYTHING. Once it breaks, you’re done. Conclusion: This is an AWESOME product; but the only way it makes sense economically is if you buy extra carafes, and stick to it. After a while, the “fun” might wear off, and you’re simply stuck making soda. You also need to be satisfied with your super market’s brand of soda, as this is going to taste very similar to it. However, you get to determine how much you make, how much syrup you use, the level of carbonation, and of course, you do make it with your OWN tap water. From a “green” perspective, you completely eliminate cans and plastic bottles in your home; and the carbonators are easily recycled at a local retailer. All in all, two green thumbs way up.